I was one of the “Vietnamese and American businesspeople” who attended a July 22nd luncheon at the Melia Hotel in Hanoi in celebration of 15 years of diplomatic relations between the US and Vietnam. Among the VIP guests were US Secretary of State Hillary Clinton, Vietnam’s Deputy Prime Minister and Foreign Minister Pham Gia Khiem, US Ambassador Michael Michalak, and Mr. Vu Xuan Hong, president of the Vietnam Union of Friendship Organizations (VUFO). Well, Vietnam and the United States have chosen a different course. Thirty-five years ago we ended a war that inflicted terrible suffering on both our nations, and still remains a living memory for many of our people. Despite that pain, we dedicated ourselves to the hard work of building peace. We have consistently moved in the direction of engagement and cooperation. Even on those issues where we disagree, we still reach for dialogue. This has not been easy, but it has been worth every bit of effort, that so many people in both countries have decided to invest in it. That is evident in the partnerships formed between our businesses, the thousands of students who are participating in educational exchanges, the hundreds of thousands of our citizens who cross the ocean each year to explore the other’s country and culture. These ties enrich us, and are proof of a peace that exists not only on paper, but is rooted in the minds and hearts of the American and Vietnamese people. Yet our work continues. And we are prepared to take the U.S.-Vietnam relationship to the next level of engagement, cooperation, friendship, and partnership. It is true that profound differences exist, particularly over the question of political freedoms… But this is not a relationship that is fixed upon our differences. We have learned to see each other, not as former enemies, but as actual and potential partners, colleagues, and friends. 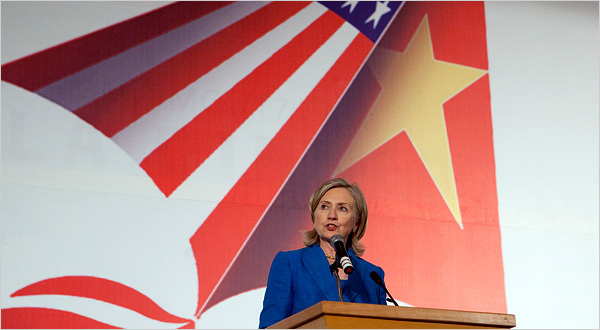 Interestingly, Washington Post coverage In Hanoi, Clinton highlights closer ties with Vietnam, pushes for human rights chose to lead off with this paragraph: The Obama administration is ready to move to the “next level” of close relations with Vietnam despite concerns and “profound differences” over human rights, Secretary of State Hillary Rodham Clinton said during a visit to Hanoi on Thursday. 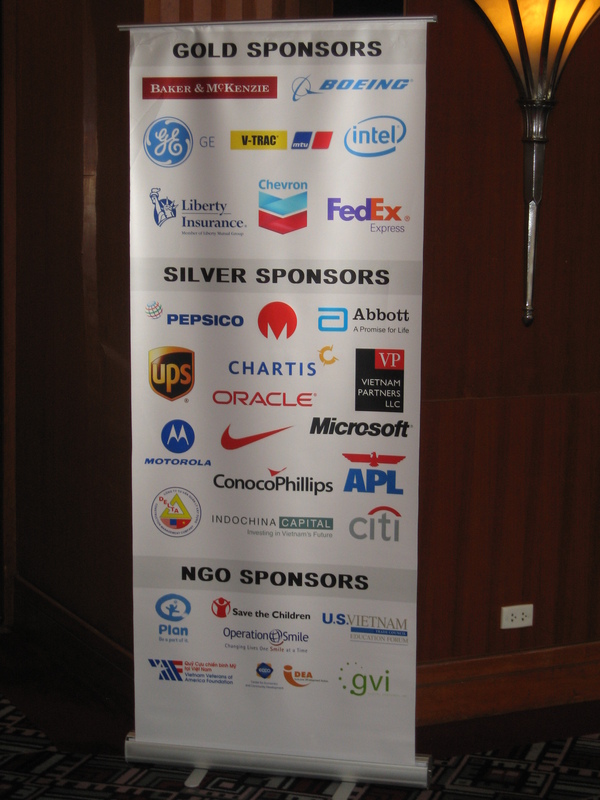 The luncheon, which the American Chamber of Commerce (AmCham)-Hanoi did a yeoman’s job of organizing on short notice – in cooperation with VUFO, the Vietnam-USA Society and the US-Vietnam Trade Council Education Forum – received plenty of last-minute corporate support. This support meant that the tickets, originally priced at $100 per person, were free for those who registered late last week and that a sizable donation will be made to a Vietnamese children’s charity. 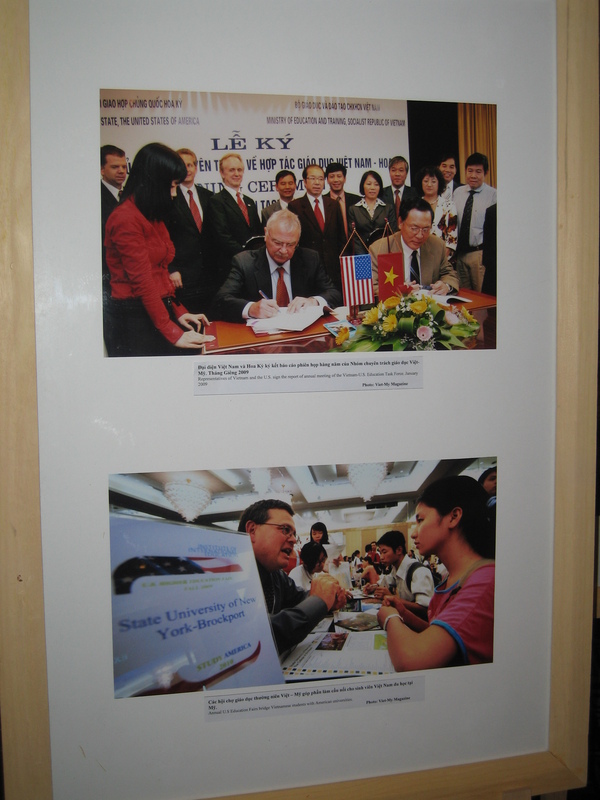 In the foyer was a photo exhibition that offered a visual chronicle of progress in US-Vietnam relations over the past 15 years, including educational exchange. 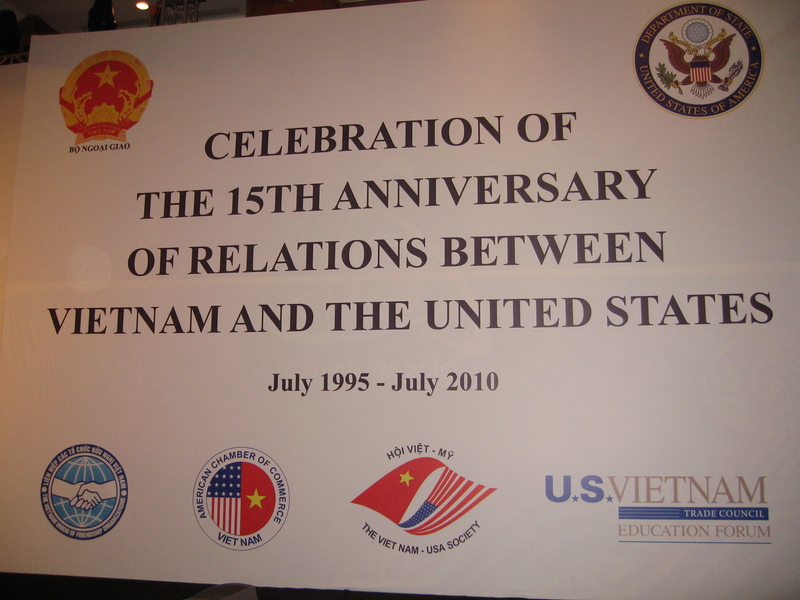 a series of articles about the 15th anniversary of Vietnam-US relations from VietnamNet Bridge, the English language version of VietnamNet.